I know these pics have no snow. Get over it. Matt and I took a trip to Powderhorn on January 4, 2009. 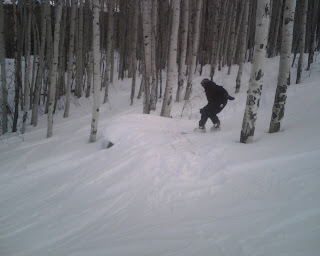 I had not skied Powderhorn for over 10 years and hadn't skied period for about as long. The new shaped skis made it easy to transition back from my snowboard. Things haven't changed much at Powderhorn in the past 10 years. I showed Matt all the nice jumps on Dude, Lower Dude (photo 1), and Snowcloud. Photo 2 is from the top of Wonderbump. The binding on my rental skis broke on the first run. I had to walk down to midway and catch a ride down to the lodge to rent another set. I'm used to Copper Mountains high-speed lifts and long runs. 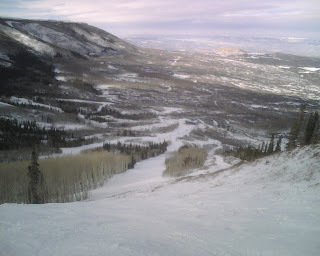 The slow lifts and short runs of Powderhorn have at best a nostalgic quality. Not having to fight I-70 traffic makes Powderhorn great on the other hand. On January 24th I took my first trip to Loveland. The slog up I-70 was a brutal 2 hours from Aurora. It was a windy snowy day, but lots of powder. I like the way the mountain is laid out: it is easy to move from one end to the other. Again, the lifts are not high speed and the runs seem short. To avoid the slow ride on lift 2, take lift 1 first then hop on 2 at midway. I enjoyed the runs on lift 1 most (photo 3), but it is a lot less crowded on lifts 4&8 (photo 4). The wind chill above treeline was brutal. The shortcut under I-70 back to the lodge is quirky and cool. It's a beautiful January day with temperatures in the mid-sixties so back to the Flatirons I go for a climb. Don't tell the rest of the country about the great weather we have in Colorado. This time I picked a climb called Free Shot which makes Gerry Roach's list of "classic" scrambles. From the NCAR trailhead you head up the Mallory Cave trail past two large boulders called the Square and Babyhorn. To your right is Der Zerkle and to the left is Dinosaur Rock. I knew I was not quite up to Der Freischutz, but Dinosaur Rock beckoned. The face is a 5.4 climb, but I skirted around keeping the climbing easier (photo 2). I wanted to get a view of Der Freischutz. Check out the top photo. Backtracking to the trail I found the base of DerF and the start of the East Face (N39 58.400 W105 17.299). This is 5.0 territory but doesn't the rock look inviting (photo 3)? I reached the ridge top and the route wasn't immediately evident. I back tracked a bit, but the downclimb wasn't appealing. Being my first time on this rock I wasn't sure I could escape the top, but I proceeded up. It turns out the downclimb is easier a bit higher up. As the shot of adreneline coursed my body I decided to continue to Mallory Cave rather than continue up Free Shot which was now in view. There were many kids on the Class 3 approach to Mallory Cave so I back tracked and found a piece of crack and ledge to climb on upper Der Freischutz above Free Shot. It was a little snowy but I managed to shinny up. At the top I discovered some climbers tackling the backside of DerF. The downclimb from the peak was challenging but quite fun. I had to duck under and through some boulders to make my way down to the trail. I will be back in order to properly climb Free Shot (photo 4) and the South Face of Der Freischutz. I'm learning that making my own route can be just as rewarding. On the way back to NCAR, the deer herd in the large park has grown to about 15+ now. I even spotted 3 deer in the park far below the NCAR trail. Everyone was enjoying the fine January day in the Flatirons.